The tourists come in masses to Santorini. They come for the enchanting triangle-combo of dark blue sea colours, whitewashed houses and beautiful light blue sky. They are more than happy to let their breath be taken away by the mind-blowing landscapes and picturesque villages. The connoisseurs also have this charming volcanic Greek island on their to-visit-list. They are attracted by the same fabulous views but topped with the final touch of Santorini cuisine and the secret local magical places to be discovered. Let’s be connoisseurs! After landing in Santorini, rent a car – no discussion on this point! Even if the island is pretty small (73 km2), you need a car to really get around. And yes, before you ask be warned: it often gets a little bit crazy to be in the middle of the Greek traffic, so please avoid the center of the capital Thira. A walk in Thira is a good way to start exploring the island. Keep in mind, that it might be crowded, it might be a little too cliche-like, but it’s a place to feel the Santorini-vibes. The view to the volcano, the typical architecture, the fresh veggies and seafood on display in front of the restaurants, the donkeys in the streets, the exaggerated amount of souvenir-shops… and a little bit of the beaten track, the small but absolutely worth seeing Museum of Prehistorical Thira. Colourful mosaics and incredibly well kept paintings on ceramics can be viewed in the museum. The archaeological site of Akrotiri, which reopened in 2012, is another place to take you back up to Minoan times. 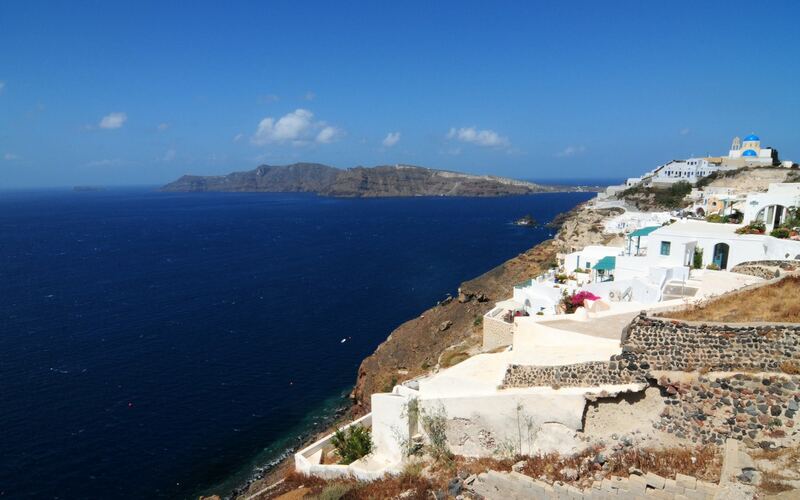 After you have had your fill, the next stop is the town of Oia in the north. This is another well-know tourist point, where it gets very busy for sunset. During the rest of the day the town is much calmer than Thira and offers plenty of charming and photogenic details (nature, architecture, and gastronomy-related). My personal number one of secret magical corners is the beach of Vlychada. The road to the beach is lined up with wild thyme bushes and typical Santorini vine-sorts. 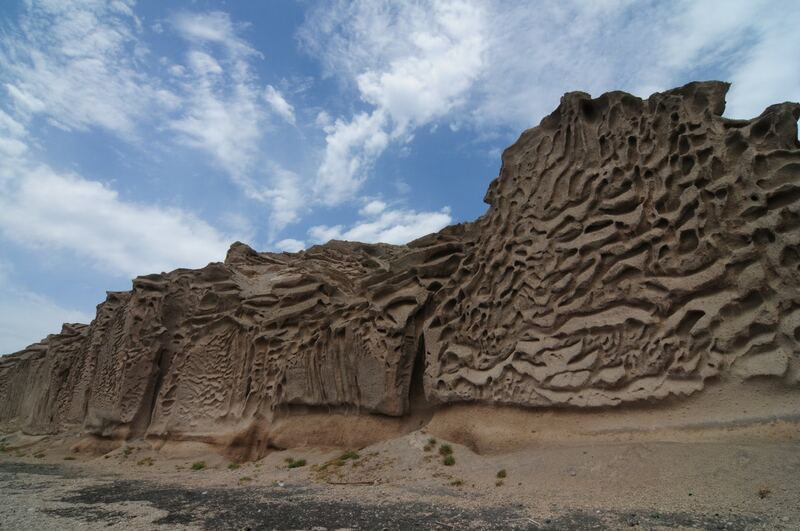 Once at the coast sighting the huge volcanic wave-shaped cliffs, covered in holes makes the walk unforgettable. Of course there is the famous Red Beach and a place called the White beach, but be curious and look for you own treasure – like a tiny church in the middle of nowhere or a scenic view on a lighthouse-rock – find your gems! During this culture/nature/history-discovery one gets to know, sometimes unconsciously, the gastronomy specialties too. 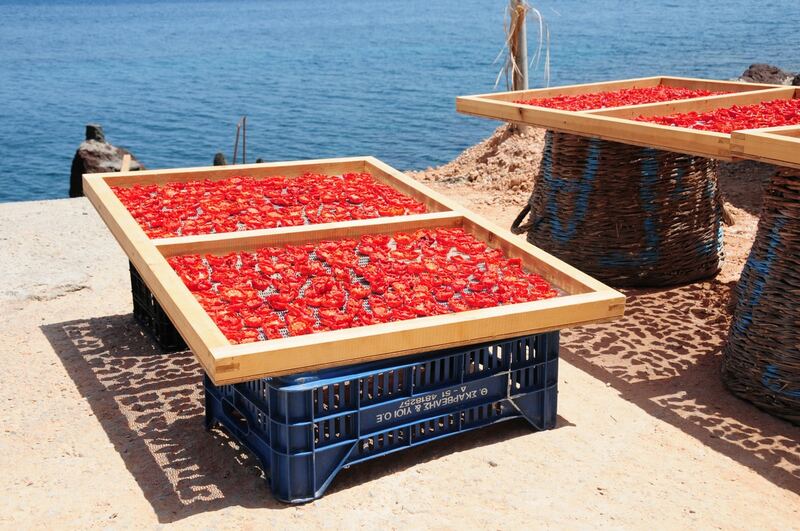 In front of the houses the local cherry tomatoes are drying in the sun. The Santorini white eggplants are sweet, have almost no seeds and no bitter taste as other sorts. The diverse and delicious Greek-island-inspired cuisine is at every corner and open the whole day long. Next to fried fish, grilled octopus, and other fresh seafood with pasta, there are a few local dishes. Tomato fritters (tomatokeftedes), Santorini-fava-purée (made from yellow split-peas), various local sweets, wine from the indigenous sorts – Assyrtiko and Nychteri, and last but not least the sweet Vin Santo. 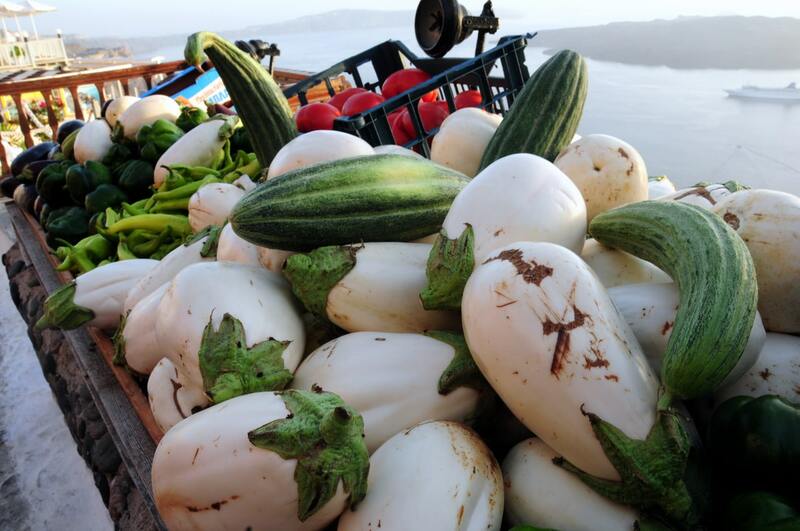 The fertile volcanic soil and the Aegean breeze have created a unique mix for scrumptious produce and natural products – and they are for sure not to be missed during your tour of Santorini. Jana is a real fruit-junkie (watermelon being her favourite) and a big (goat-)cheese-lover. She speaks six languages next to her mother tongue Bulgarian and is in love with gourmet discoveries while travelling, diving and sunshine-catching.